When it comes to making libraries and other environments accessible for people with disabilities, the focus tends to be on meeting accessibility requirements set forth in laws such as the Americans with Disabilities Act (ADA). While this is certainly an admirable and necessary goal, retrofitting spaces, programs, and services to work for individuals with disabilities is generally less effective and inclusive than adopting Universal Design, from the preliminary planning stages to the final product. Originally conceived of by Ronald L. Mace, an architect who used a wheelchair, as an approach to architectural design, Universal Design refers to the idea of designing spaces, products, services, and more in a way that makes them as functional as possible for people of all ages, abilities, and backgrounds. This differs from an accessibility approach in two noteworthy ways. First, it looks to improve usability for all, not just those who identify as disabled. Second, it focuses on finding one solution that will function equally for everyone, rather than fragmented approaches that divide users. Top: Mounted iPads with accessibility features promote the Universal Design principle of Equity of Use. A wide range of patrons can utilize them. Bottom left to right: This space supports Flexibility in Use with multimedia options, movable furniture, and diverse seating; A play area includes items on magnetic surfaces and wooden blocks, allowing kids with varying manual dexterities to safely and successfully play. One of the most common examples of Universal Design is a ramp (including a curb cut), which allows everyone to use the same design feature. Ramps are useful not only for those who use wheelchairs, but for anyone pushing a stroller or a cart. This contrasts with wheelchair lifts, which are often used to make staircases accessible—but are only a viable solution for those using wheelchairs. Another example that librarians almost certainly encounter is lever door handles, which are generally easier for people with certain disabilities, as well as small children. At its best, Universal Design produces an experience that is seamless and convenient for the widest array of individuals. Collectively, they can serve as a guide for everything from designing new spaces to creating signage to rethinking programming at your library. Even better, design projects guided by these principles can provide a single, optimized experience for a variety of patrons, including individuals with disabilities, older adults, English language learners, distracted users, and those who fall into several of these categories. Touching on the needs of so many populations in a single project is also an act of advocacy. By demonstrating how a single, well-designed solution benefits everyone, librarians can advocate for putting additional resources toward these vital efforts, particularly if they also help the library to meet accessibility standards required by law. Though there are those who argue that no design project can ever result in a truly universal solution, application of these Universal Design principles, together with an openness to continual improvement through user feedback, can help to make spaces, programs, and services available to as many people as possible. This concept has been applied in many realms. Universal Design for Learning (UDL) is a subfield developed by Anne Meyer, cofounder and chief of education design, emeritus, and David Rose, cofounder and chief education officer, at CAST (the Center for Applied Special Technology), to apply these principles to the creation of learning materials. 1. Representing their content in multiple ways, for example through a combination of text, images, multimedia content, and more. 2. Allowing students to demonstrate their mastery of a topic in multiple ways, for example by writing or drawing. 3. Offering a variety of ways for learners to engage with the content and develop their own motivation. The flexibility built into this approach simultaneously provides a better learning experience for all students and offers a way for students with disabilities to participate without special accommodations. As Rose puts it, this makes it possible to “diminish the number of kids we pathologize, marginalize, exclude, or fail.” This approach also allows educators to move beyond the focus on lower-level decoding activities and work with all students on comprehension tasks. Brooklyn Public Library’s Inclusive Services events are designed with features that let all kids participate, rather than accommodations that might set some apart. Universal Design can bring a new perspective to virtually any library initiative, from the smallest remodeling project to the design of new services and programs. 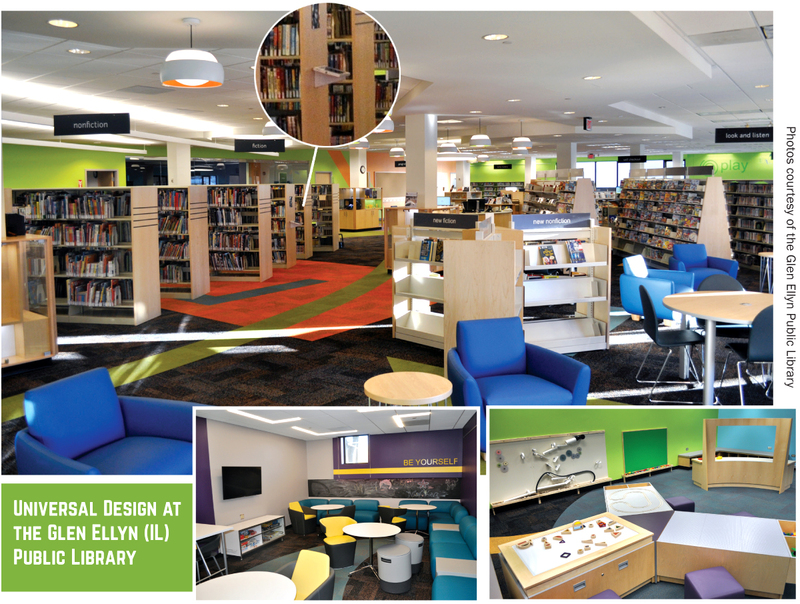 When Renee Grassi, youth services manager at Dakota County (MN) Library, was youth department director at Glen Ellyn (IL) Public Library, she incorporated aspects of Universal Design into the youth department remodel. In particular, the Flexibility in Use principle guided Grassi to select a variety of types of seating, such as “bar-like stools that provided stability, soft couch-like sectionals, upright chairs with arms, and a new type of active seating, which allowed the user to wobble,” she says. It also made her rethink the size and shape of a new staff service desk to better meet patron and staff needs; she did so by creating more space on each side of the computer station. If your library doesn’t have the resources to completely redesign spaces, these principles can be implemented in other ways. At Brooklyn Public Library (BPL), the Inclusive Services department has been following these concepts for all of its programs. Carrie Banks, supervising librarian for Inclusive Services, says, “We don’t even think about it anymore. It’s just how we do business.” This approach permeates collection decisions, programming design, and more. In fact, Inclusive Services was the first section of BPL to purchase audiobooks. Since then, audiobooks have grown to be “a huge part of the library’s circulation overall,” says Banks, who was also a Library Journal Mover & Shaker. Program design at Inclusive Services starts with the assumption of widespread, diverse patron interest in a topic. Each program “should be designed from the ground up to include everybody,” Banks says, in order to reduce later adaptations and avoid excluding anyone. This means keeping a clear focus on Universal Design and UDL from start to finish. 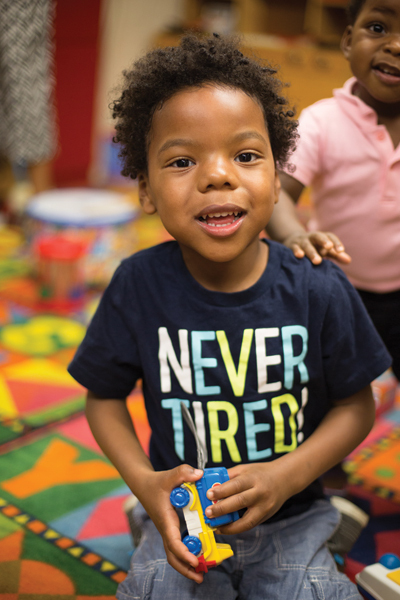 For example, a typical children’s program in one of BPL’s five Inclusive Services locations starts with a combination of stories, songs, and movements. It finishes with an art project designed to be high-contrast and incorporate a broad range of materials. One of Banks’s favorite programming themes, described in her 2004 Children & Libraries article, “All Kinds of Flowers Grow Here,” is snow. During a craft activity, kids are given black construction paper and white supplies such as crayons, pens, and collage materials, to render a snowy scene. Blind and low-vision kids can select textured materials, and those with limited motor skills can make a collage or ask a staff member to serve as their scribe. Bottom line: “If it is designed well, it will work for everybody,” Banks says. Grassi’s advice for librarians hoping to adopt Universal Design is to “think beyond libraries” when looking for inspiration. Some of the best ideas might come from “schools, museums, accessible living facilities, and other public buildings,” she notes, since many of these organizations are also looking to create an inclusive environment. To ensure success, Banks advises involving individuals with disabilities in a design process early and building in time to continue revising and improving on your initial effort. For example, at BPL’s Inclusive Services, librarians ran multiple focus groups with teens, after months of design and planning, to ensure that the programming they were launching would meet the needs of all their teenagers. Ultimately, no matter where you start applying Universal Design at your library, it is sure to help you create a better, more welcoming place for all. Physical Renovations For libraries that have the budget to make physical changes to their spaces or are already planning renovations, consider how you can make features inclusive. Rather than offering a separate accessible entrance, could you replace steps at your door with a ramp? Could your service desks be adjustable or have sections at different heights? Maker spaces If your library has a maker space, you can join others that are making their spaces usable by all through Universal Design and feature projects of interest to participants with and without disabilities. 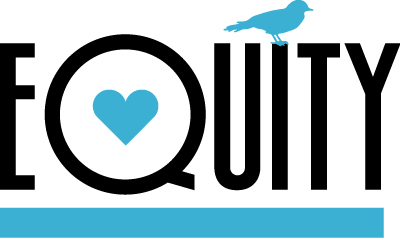 Check out the work DIYability and libraries are doing for inspiration and project ideas. Multimedia displays As you design book displays, consider how you can make them interesting for all kids by including large-print books, audiobooks, and other multimedia. Flexible furniture From adjustable height tables to multiple seating options, there are many options for making your library more accessible, welcoming, and inclusive through furniture selection. For an example of these changes in a public library setting, check out Glen Ellyn Public Library’s 2015 Youth Department Remodel. Deploy technology thoughtfully As Renee Grassi noted, tech choices can make your library more usable for all patrons. When selecting what to buy, consider which accessibility features are built-in and how easy it will be to use for those with differing levels of ability and experience. Inclusive craft projects Plan craft projects to feature a range of textures, multiple colors, and materials that will work for those who with limited dexterity. Sensory storytimes Storytimes designed to involve all of the senses can appeal to kids with and without disabilities. For an example of how to structure such an event, read about Ashley Waring’s experience at the Reading Public Library on the ALSC Blog. Partner with the community An important element of succeeding with Universal Design is iterative improvement. The best way to achieve that is to partner with individuals with and without disabilities in order to learn more about how they use your library and how it could be improved to better meet their needs. Garden club If your library has outside space, consider starting an inclusive garden club like the one at the Brooklyn Public Library. Outdoor and physical activities can offer lots of ways for patrons with and without disabilities to work together with each child offering their own unique skills. Offer multiple types of spaces In addition to providing a variety of flexible furniture, it is important to offer spaces where kids can find different noise levels and activity types, such as quiet rooms and spaces where kids and their guardians can find more privacy and peace. 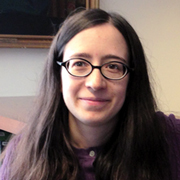 Carli Spina is head librarian of assessment and outreach at the Boston College Libraries.